Joel Greene here from Condo Hotel Center with a question for you. For me, it’s a road trip to Atlanta with college buddies going back many years. The fun we had always makes me think fondly of the city. Well, some 25 years later, I’m turning my sights back toward Atlanta with our newest condominium offering. 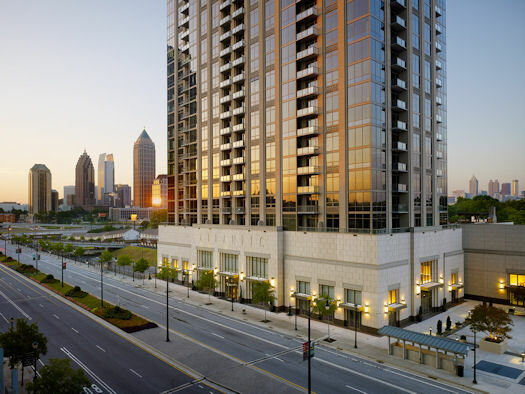 Standing 47 stories high, the tallest residential building in Midtownand one of the tallest in all of Atlanta is The Atlantic, today’s featured property. The oversized swimming pool with hot tub spa is just one of The Atlantic’s many amenities. 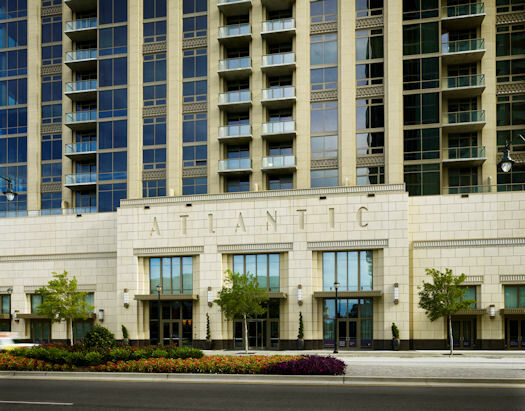 The Atlantic is located in Atlantic Station, a development so vast and all-inclusive that it was given its own zip code when built, 30363. The 138-acre, mixed-use development opened in 2005 just west of Midtown Atlanta. It combines an attractive mix of housing options with world-class restaurants, sidewalk cafes, expansive parks, movie theaters, shopping and entertainment. Fun events take place at Atlantic Station all year long. I took a peek at the Atlantic Station newsletter and noticed that in the months ahead, for example, there will be live music; movies in Central Park with games and giveaways; free yoga sessions with instructors from some of the top Yoga studios in Atlanta; Food Truck Fridays; BBQ Festival; Artist’s Market; and the Howl-o-ween Fall Festival. Living at the Atlantic means that all of your needs are met just steps from your front door at the Atlantic Station. Everything from entertainment, movies, shopping hotspots and restaurants are right there. And, so is Publix grocery store, close enough to walk to. Within 10 minutes’ drive of The Atlantic is Philips Arena, home of the NBA’s Hawks, and the Georgia Dome, home of the NFL’s Falcons. 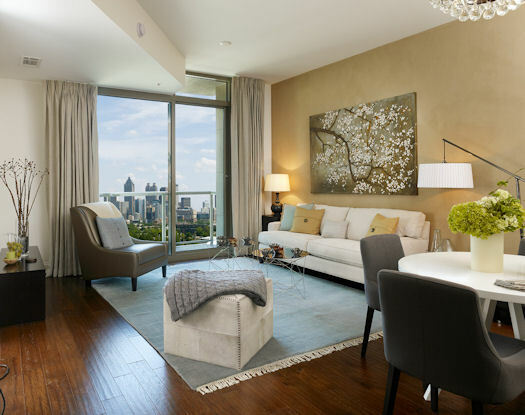 You can also easily drive to Midtown, Downtown or Buckhead, all just a couple of miles away. Also worth mentioning is that The Atlantic is less than two miles from Georgia Tech University. If you have a child at the university, you may see owning a condo for four years as a great alternative to the school’s costly dorms. The Atlantic was built by Novare Group, a world-class developer in the urban real estate market. Novare had already built many high-quality homes in Atlanta and other nearby cities, over 6,000 condominiums in total. 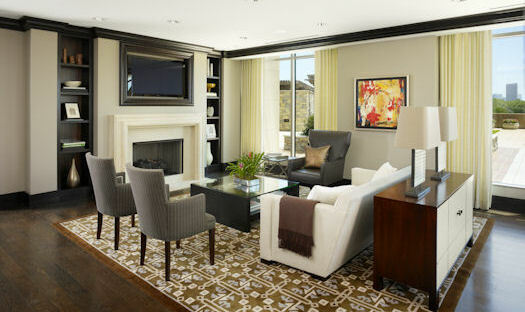 They set out to make The Atlantic the premier residence of the Midtown/Downtown Atlanta area. The Atlantic was built by Novare Group, a world-class condo developer in Atlanta and nearby cities. Unfortunately when the market swung, in September 2009, the FDIC took ownership of their lender’s nationwide portfolio of residential real estate and construction loans, which included this property. The Atlantic ended up in the hands of ST Residential, made up of the FDIC and Starwood Capital, a private investment firm. ST sold $800 million of property, including more condos than any other company in the U.S. in the past year. 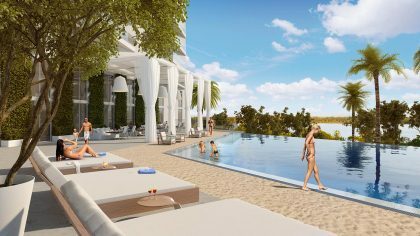 ST has priced The Atlantic condos to sell quickly at close to bank foreclosure prices, and at approximately 40%-45% less than their original prices, despite their high-end finishes and the development’s first-class amenities. View from The Atlantic of the downtown Atlanta skyline. The Atlantic offers 401 spacious residences with six unique floor plans of one-, two- and three-bedroom condos of roughly 1,000-2,000 sq. 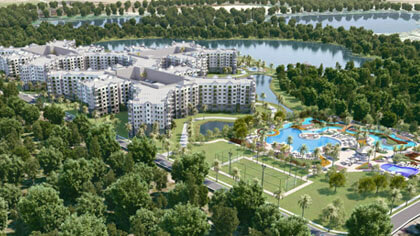 ft. and penthouse units that exceed 3,000 sq. ft. 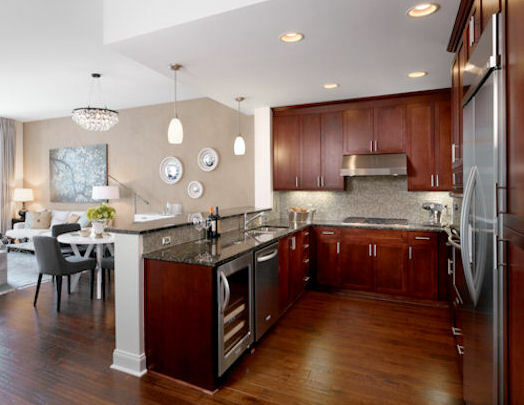 Choose from six unique floor plans of one-, two- and three-bedroom condos. These residences feature 10- to 11-foot ceilings, floor-to-ceiling glass windows, hardwood flooring and fine finishes such as stainless steel appliances and granite countertops, not to mention the breathtaking views from sweeping balconies. Prices at The Atlantic range from $173,700 to $1,099,700. Financing is available. HOA fees and real estate taxes are low. And if you’re an investor, you’ll be glad to know rental rates are high. That’s due to The Atlantic’s phenomenal location and a restriction on the number of condos that may be sold in the property to investors who plan to lease out their units. 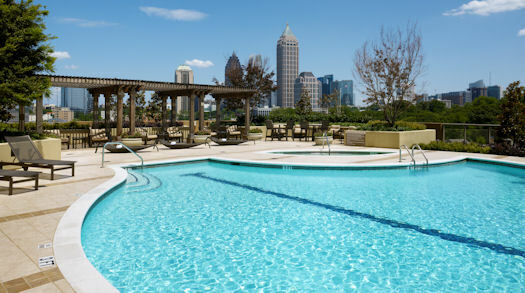 If you are interested in living in the best Atlanta has to offer, you may go to contract with a nominal deposit of $3,000 for a one-bedroom condo, $5,000 for a two-bedroom condo, $10,000 for a three-bedroom condo, and $25,000 for a penthouse unit. And if this will be your first or second home, Met Life is prepared to make the loan with 20% down. The condos are delivered with hardwood floors and can be closed on in just a few weeks. Want to know more? I’ve put together a comprehensive data sheet on The Atlantic that has all the details. Just provide your name and contact information, per the developer’s requirements, and we’ll send it right out to you. 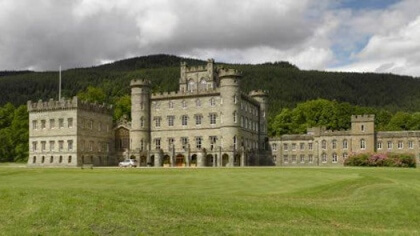 Then, I’d welcome the opportunity to arrange for you to see the property. Request The Atlantic data sheet here. 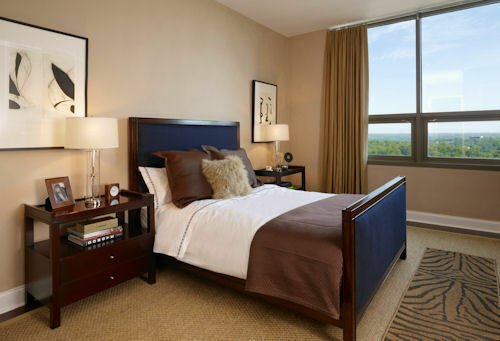 Contact us today to arrange a tour of The Atlantic and discuss available condo inventory. As always a big thank you for your interest in the properties we showcase at Condo Hotel Center. If you know anyone who’d consider investing in Atlanta real estate, please feel free to pass along this Property Alert. And, if Atlanta is of interest to you, but this property does not meet your specific needs, drop me a line to let me know, as I may soon have some other options. If you want to see our listings in other cities and states, please visit our Featured Properties page.